I'll pick up the story in Cork, where I visited several Megaliths dotting the terrain. Prior to heading to an artist residency in Kerry, I spent a week visiting this mythical countryside, walking the spaces of my ancestors, learning about my lineage. On my way to the second Megalith, my journey was slowed by a series of spectacles that forced me to stop and engage. One of them was an abandoned mill loitering beside a roaring stream. Once out of the car, I walked over a stone bridge and peered into the exoskeleton of a former life. Plants encroached in the absence of human activity, opportunistically occupying every sunny platform. Three stories of an obsolete industry. Like the stream, man-made innovations ebb and flow. These crumbling stone structures were a constant in the landscape. How charming that Ireland didn't level these artifacts, the way we do in NYC. The drive felt a a bit like the "gentrification" of Brooklyn. Every half mile or so, a home was being dismantled. In Ireland this occurred slowly, from the elements. I dug a little deeper into these homes on my return to the US. Why were there so many of them? The abandoned buildings remain empty because there is no one to occupy them. Ireland's population went from 8 million in1840 to 3 million in 1849. A loss of 5 million people in 9 years. 62% of the population. The Famine. 1 million people emigrated, 1 million died from starvation and the rest died slowly from diseases that prey on weakened populations. Success on some level, I suppose, Catholics were nearly eliminated. Religion was the dividing line between life and death, thriving and suffering, hate and love. Almost 200 years later, Ireland's population has stabilized at 6.5 million. Disregard for those conquered by a superior military force is common in contemporary culture but not, as some would suggest, normal human behavior. The book, The Age Of Empathy, lends insight into the construct that has shifted responsibility off of community and onto profit. Leaving the mill, my map told me it wasn't much further to the next Megalith. I was ready to get there. A left, then a quick right and I turned into a narrow road. I couldn't believe my eyes. This. Every day. For 3 weeks. Was my life. Yes. I want to go back. On my travels, I had noticed flashes of bright yellow amongst the greens and greys of foliage and stone. It was daffodil season. They were everywhere. This turn off the road brought me into the place where they were cultivated. Fields of poppieeeees!!! I mean daffodils. Do think Wizard of Oz though, they reached as far as my eye could see and I wondered if I had driven through a wormhole and landed in the Netherlands. After a few moments of admiration - through my windshield - it was pouring again, I fishtailed down the muddy road furrowed deeply by a tractor. A pony-sized dog bounded out of a barn blocking the road up ahead, barking and springing a foot into the air as it circled my car. I carefully turned about, checked the map and realized I had turned one street too soon. The next turn was yet another "OMG" moment. Those Neolithic folk certainly knew how to site their Megaliths 5000 years ago. A mile or so ahead was a line of dark silhouettes at the top of a ridge. I had arrived. Pulling into a grassy turn off, I noticed a singular stone sitting in the middle of a field. It was shorter and wider than the others I'd seen and completely cleared of vegetation. Sheep or an aware farmer? I climbed the fence, sloshed through the muddy grass and stood beside the stone so it aligned with the stones on the ridge. A marker? "Go here first, then head up the hill to that row of dark things. Just wait til you see what's there! Or... When you stand on this ridge, look down the hill a bit towards that short stone and then beyond ..." Toward what? The stars, the sunset, another Alignment now obscured by trees or homes? It was midday and there was no way of knowing what would appear later in the sky and there was nothing written about this place. The path between this singular stone and the alignment was obstructed by walls covered in brambles so I climbed back over the fence, into my car and made my way up the hill. The Megalith peeked out between breaks in the wall that lined the street. I couldn't take my eyes off of it. All ages and religions have resorted to an Axis Mundi as a symbol for the center of the universe. They can take the form of tree, temple, figure or in this case stone. Elevated, they force the eye upward, a gesture that inspires reverence, facilitating an encounter with the sky, the unknown, the great beyond, the other side, the 4th dimension. The path that led into the stones passed closely beside an abandoned cottage and this time there was a sign that said "Do not enter". It was old and slightly akimbo. The. Megaliths. Were. In. The. Backyard. 75 yards on. At one point I remember thinking that everyone must have a Megalith in their yard. As the trip went on, the 5000+ year old stones appeared on horizons, around corners, in the center of valleys, wherever there was a breathtaking view. This, by the way, was what inspired my minilith and offering series. The stones are a spectacle, visible from miles away. And they mark the spectacle of the landscape around them. Stop. Slow down. This is bigger than you. Tourism is driven by this phenomenon. We seek out these scenes and then share them with others in an attempt to understand or confirm the presence of the sublime. Social media is the latest platform, replacing photo-albums, slideshows and perhaps the earliest of cave paintings, "You wouldn't believe the herd of bison I saw today. They looked something like this." I walked along the overgrown path, despite the sign. Come on! These things were part of my DNA. They belonged to me as much as anyone. No bounding dogs in sight and it was clear no one had lived there for a while. It was cold. The rain had switched to a mix of snow and shard-like sleet that sliced at my face, hands and... camera. I bought it just for this trip, knowing I had to invent a project other than sculpture while at the residency. I had no desire to ship sculpture internationally. 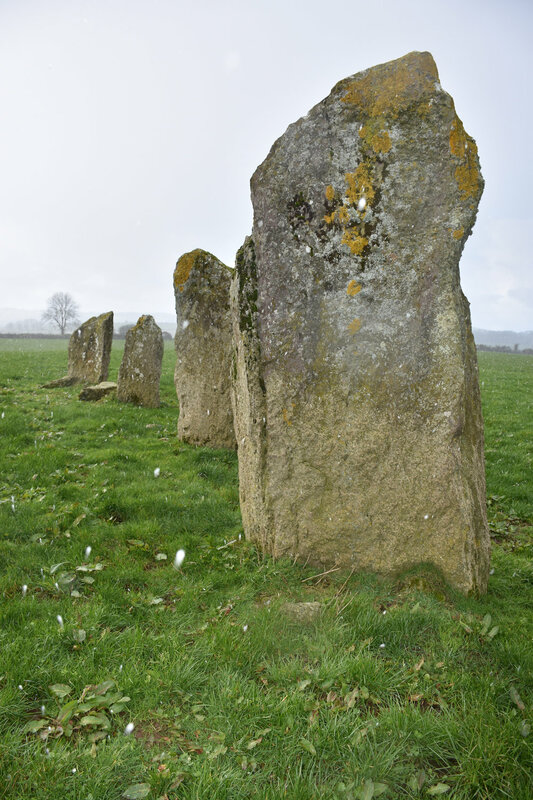 The stones had no trough around them so I tucked my back up against the largest and watched as a half circle of white dots, slicing diagonally toward the ground, formed inches from my body. It was working, I was protected, so I waited . A few minutes later, the sun broke through the clouds, the biting wind ceased and I started to defrost. When I stepped out from behind the stone and looked beyond, the fog was clearing to reveal field after field after field after field after field. Beams of light broke through the storm clouds that had now moved out toward the horizon. Crepuscular rays, Sunbeams, Angel lights, Sun rays, God rays. This dramatic light-play requires a vast distance to make the near-parallel shafts of light appear to spread out over the landscape. This is perspective at play, our eyes see them converge at cloud level, like railroad lines at the horizon. My scientific background was capable of separating the mystical from this occurrence but it imposed itself on a gut level. My heart sped up, I caught my breath and I was moved to tears, grateful for this convergence of time, this simultaneity, this overlap between ancestor and descendent. I stayed for about an hour. Just me and the stones, no other human within seeing or hearing distance. They were different from the last alignment. Instead of standing shoulder to shoulder like a row of soldiers, they were stacked like dominos, back to front. Only the top portion of each was covered in grey, green and puce colored lichen. It was as if the bottoms had been dipped in an acid bath. What radiated from the ground that prevented the algae/bacteria hybrid from finding a foothold? I ran my hands along the surfaces of the stones and envisioned my ancestors hands, calloused and meaty as they shoved the stones into an upright position. I moved my face closer. Were those carvings or just natural aberrations in the stone? The lichen obscured. No secrets would be revealed on this day. Abandoned building, stream, sun, greeeeeen, repeat. I think Rothko would have liked these daffodils. What purpose does this stone serve? I aligned it with the alignment (right). A gift at their feet, newly emerging nettles. A bio-available source of Iron, Calcium and lots of vitamins. These fresh ones in a tea, steeped overnight are extra pungent. Make sure you know what you're picking. I keep meeting people whose grandmothers use to dry a sheet sized spread of these to last them through the year - or put them in soups. They know which mushrooms to pick in the woods, which plants - but not their medicine. They're all from Eastern Europe or Ireland. It seems the Iron Curtain and living on an island curtailed some things and held onto others. Their grandmothers might have recognized the shifting tides and not passed on the knowledge or more likely they were so young, they don't remember. Their parents - dealing with the stresses of life. Standing by the Megaliths looking back at the cottage and the road. I wonder what it must have been like to have ancient magic in your backyard. Were they tuned in? Or were they like those behind the Iron Curtain? Too busy trying to stay alive. No one has been in this house for a while. The chimney curves to the left. Lavender? And 70's green?